The Bold Collection is an upscale showcase series loved by store designers and retailers alike. Jewelry showcases in this glass display case series are build with HPL slab end construction with 1 ½” decorative accents. 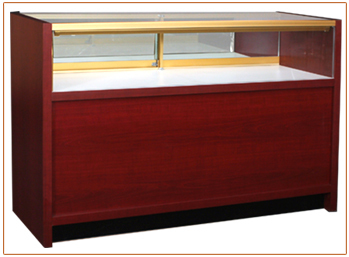 These display cases for jewelry have frameless mirror doors on the clerk side of the jewelry display box. Terrific showcase options include custom HPL colors, LED showcase lighting, security locks, showcase storage options and more. Ask us about glass bonding! Glass display area of a Bold jewelry display case is 12" high and 20" deep. Wood base is 22" high. Black kick base is 4" high. Overall height is 38". Standard storage area is open with an adjustable shelf.